Situated in the northeastern quadrant of Custer County, Custer City is located on State Highway 33, four miles east of U.S. Highway 183. Originally, Custer City was known as Graves, when a post office was established there on January 22, 1894, in the dugout home of Phillip Graves, who served as the first postmaster. Graves had participated in the Cheyenne-Arapaho Opening on April 19, 1892. Between 1901 and 1903 the Blackwell, Enid and Southwestern Railroad (later the St. Louis and San Francisco Railway) constructed a line that connected the town with Darrow in Blaine County to the northeast and the Red River to the south. 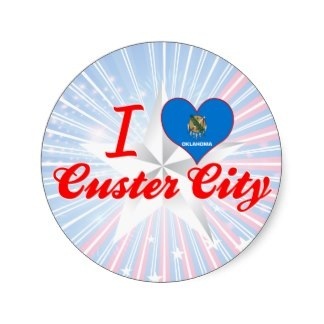 On September 28, 1904, the post office name changed to Custer City, in honor of Lt. Col. George A. Custer (who had reached the rank of major general during the Civil War). Two years later the Kansas City, Mexico and Orient Railway (later the Atchison, Topeka and Santa Fe Railway) also built a line through Custer City.